APS 330 – Have the Banks Disclosed Properly? One thing I noted during a look through all of the major banks’ APS 330 disclosures is that the view of risk they took was completely one sided. For example, in the market risk disclosures VaR exceptions were reported as if the only exceptions were the downside ones – if the bank made money on the day it was not an exception even if it was outlide the VaR limits. It’s virtually impossible to have returns like Madoff reported, and it should have been a major warning signal. It should have been, but it was not as few people cared to look at the signal, as a one sided view of risk is common. Looking at APS 330, though, I think the view they have taken of the disclosures is actually not following the Standard and is likely to encourage risk taking activity. Not, of course, that I think that any of the banks here are running any rackets like Bernie’s. For example, if you look at the Westpac disclosures under APS 330 you see the same sort of view of risk1. See that red line going down at an angle? This implies that it is only a VaR breach if there is a loss. There are, however, at least four (and maybe a further one) more sitting above where a line would have been if a line were drawn above the x axis to mirror the red one that is there. See them? There are two where the daily VaR was AUD20m, with returns of around AUD30m and a further two where the daily VaR was AUD30m but the returns were about AUD45m and AUD 55m. The AUD55m one is in fact the biggest VaR breach the bank had. The further one is (I think) at the daily VaR of AUD10m, with a return that looks suspiciously like AUD15m. If those are not VaR breaches then I know little about what VaR is. But that’s OK, isn’t it? The bank made a profit. …a comparison of VaR estimates with actual gains/losses experienced by the ADI, with analysis of important ‘outliers’ identified in back-test results. Nowhere in there does it say that the outliers are only to be the downside outliers. Table 11(b) may allow the regulator to approve this interpretation and it may be that APRA have allowed them to ignore the upside outliers, but if this is so then APRA is endorsing this. I am not sure which is worse – the Bank ignoring VaR breaches of the possibility it is under instruction from the regulator to do so. I just hope they are not reported internally like this. In any case, may I cordially suggest that this not continue. A VaR breach is a VaR breach and should be treated as such, positive or negative. 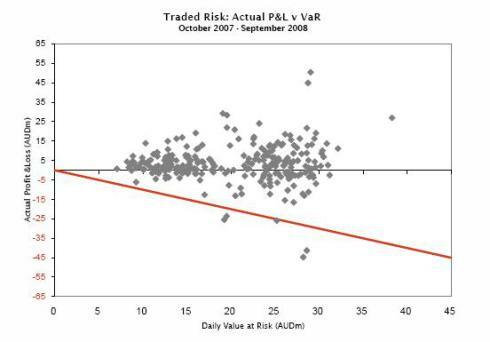 Risk is double sided – high returns normally come with high risk. A failure to investigate a high return encourages traders to take more risks and there are many trading departments where a disasterous loss has been heralded by an impressive gain. Just ask Nick Leeson, Gianni Gray, David Bullen, Vincent Ficarra and Luke Duffy, amongst many others. 1. I am picking on them as the data on this for them is at least public. I have no idea what it is for the others. Just a quick post advising interested people to go and have a look at what Alan has to say about possible solutions to the current problems. In short, and unsurprisingly, he advocates more capital. I say unsurprisingly as regulators tend to see this as a solution to all ills. Personally, I would say this would have been unlikely to help as the biggest problems seemed to be in liquidity and, recently, outright fraud. Better disclosure would also have helped – the first of the pillar 3 disclosures over the last month show the position of the Australian banking community quite well. Unfortunately, and as I have said previously, government moves to guarantee wholesale funding have made these irrlelvant. Anyway, enjoy. Just slightly early Christmas greetings from us here to all of you out there. I am hoping for a much better 2009 than 2008 was for most of us – being those of us not heavily into shorting the markets this year. I will probably be doing a few posts over the holidays, but if you would like to add any wishes or hopes for 2009 below feel free to do so, otherwise, have a great break and see you in the new year. Personally, I am hoping that 2009 does not bring a huge new wave of regulation, but I think that this is unlikely to be a fulfilled wish. It is good for me in the consulting role (someone has to make some sense of it) but one thing banks do not need at the moment is a lot more costs. After consistently getting their Basel II disclosures right (or at least the best) it is interesting to see that they cannot get other disclosures right. The complete balls up of the placement on Tuesday, at least on the information out so far, really cannot be sheeted home to anyone but CBA. Once an entity is or becomes aware of any information concerning it that a reasonable person would expect to have a material effect on the price or vale of the entities’ securities the entity must immediately tell the ASX that information. There are several exceptions, but none of these appear to apply here – particularly as the information was being hawked around the institutions. I would have thought that an increase in the provisions for bad debts by 20% would have been material in this market. This means that CBA has a clear duty to disclose that information “…immediately…”. I cannot see how this duty is discharged by handing a draft announcement to Merrills in the context of a capital placement for the exclusive use of those they were making the placement to. It was not generally announced until Tuesday night. Perhaps Merrills should have ensured that the information was more generally available (for example, by checking here) but it was not their duty to do so. They were asked to do the raising, not check the legal position and that all of the announcements had been made. For CBA to be blaming Merrills for this looks very rich indeed. CBA is covered by rule 3.1. The company secretary and the board look like they have fouled this up – badly. It is, however, good to see a former employer of mine (UBS) has made a packet out of this. It will help (if only in a small way) with their capital ratios. Market risk is the oldest part of Basel II, being substantially unchanged from the 1996 (1998 implemented) market risk amendment to the original Basel I Accord. As such, the “Big 4” have all been using these methodologies for about a decade. All that really changed with Basel II was the addition of Pillar 3 – these disclosures. As such, you would expect that these should be the clearest disclosures as the underlying systems and processes are very well understood. Over the last year, though, this area has probably undergone the most change, both globally and in Australia due to the market turmoil. The VaR numbers have probably moved enormously, particularly over the last few months as some of the extreme movements have come through to the modelling. That makes the disclosures of great interest – the only real problem is that they are effectively two months out of date when they come out – except in the case of the Commonwealth, where they were five months out of date. These range from the almost insultingly short (that’s you, Westpac) to the sorts of disclosures that probably come close to best practice (thanks – CBA again). The CBA diagrams could be used as slides in a presentation and the text used to read out at that presentation. They are that good. Daily backtesting of VaR results is performed to ensure that model integrity is maintained. A review of both the potential profit and loss outcomes is also undertaken to monitor any skew created by the historical data. That’s it – the entire description of their backtesting regime. The descriptions of stress testing and everything else are equally short. If you are looking for which disclosures to use as an example of best practice under Pillar 3, well, you would not use these unless you are attempting to work out how minimal your compliance needs to be. If you want to know how Westpac actually goes about managing these risks then using these disclosures will not be an appropriate place to start. Score – 1 out of 5 as it does comply with the standards. Sort of. The ANZ is slightly better than Westpac – but still on the marginal side of good – with just a brief description of internal processes and a little bit better description of things like backtesting. At least they are using some hard numbers for what a backtesting exception is, even if they give no examples. Westpac at least beats them here – but only with a diagram that really tells you very little. Again, do not use these to find out what the ANZ is up to or how it really manages its risks. The NAB is appreciably better in all areas than either the ANZ or Westpac, with some real disclosures of how they manage the market risk processes. The chart of backtesting results, with actual dates on it, represents a form of disclosure that gives me some confidence that they are actually managing the risks. Given the problems that the NAB have experienced in this area over the last few years, I am happy to see this. Their stress testing description, for example, while not exactly adding to the published literature is actually usable. The guernsey for the best disclosures go to the Commonwealth (again). The diagram on the first page of those disclosures, by itself, beats anything that either Westpac or the ANZ has put out. Read on and it just gets better. For example, not only have they put in a table giving each and every day over the period where backtesting exceptions occurred, but they have added the hypo loss and VaR numbers for each of those days. They have also named the functions responsible for each of the areas of risk and have added their reporting lines and some of the delegations. 4.5 out of 5 – but only because I like to leave some room for improvement. The important numbers here are the VaR numbers – but these cannot be directly compared as each of the banks has their own, differing, portions of their portfolio covered by the Standardised method – i.e. they are not included in the published VaR numbers, even if they are modelled internally using VaR. The other problem is that CBA’s numbers are as at 30 June and the others are as at 31 September. Given the increased volatility over those three months, the CBA numbers would have increased. While fairly small in the context of each of the banks, these numbers are intersting in themselves, with WBC being by far the largest and the ANZ the smallest. Given that, it is doubly disappointing that WBC chooses to say the least. Regular readers would know I am not the biggest fan of looking at the money supply and trying to work out inflation or indeed almost anything else from it. I am also not in the habit of getting specific about anything other than banks and regulators. In the US, though, the Fed is both a bank and a regulator and the position they have adopted with regard to the US money supply over the last 6 to 12 months, though, has become ridiculous. 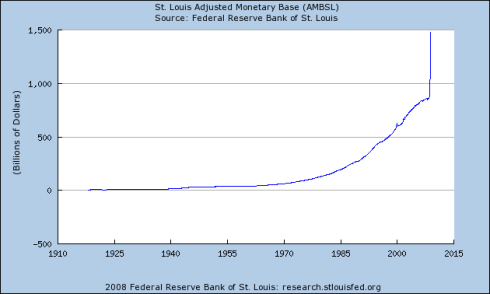 A look at this graph, from the St. Louis Federal Reserve, makes the situation plain. This cannot be a good thing. Measured money supply has almost doubled over the last 12 months – almost equalling the entire growth over the period covered by the graph in the space of less than a year. It just seems to be experimenting with the entire US economy. Not being an economist I have no real idea of the effects – but it just looks wrong. I hope most of that is just sitting in bank vaults and not being spent. If so, it should not do too much damage and can be soaked back up by the Fed next year. We’ll see. I have been pointed at this post, which suggests that the reserves are, as I thought, just sitting in bank vaults – or, possibly, on deposit with the Fed itself. If so then this is less likely to affect the real world. Either way, though, it is very, very, unusual. I am sure there will be whole books written on this period for decades to come – along with some serious revision of economics texts. Not surprisingly, in the last few months the ones on liquidity mangement have been the most popular. Prior to that it was all Basel II and AASB 139. Personally, though, I enjoy the Islamic finance ones as this is an area that fascinates me. I just wish we could get a proper Australian presence in this market. For reasons of my own, I am also glad that the “Best Practice” one is rated so highly. Since starting this blog for my own personal interests a couple of years ago I have also been pleased that there has been at least a level of interest in the blogosphere about bank regulation. Pillar III – What is the point? 809. The purpose of Pillar 3 ─ market discipline is to complement the minimum capital requirements (Pillar 1) and the supervisory review process (Pillar 2). The Committee aims to encourage market discipline by developing a set of disclosure requirements which will allow market participants to assess key pieces of information on the scope of application, capital, risk exposures, risk assessment processes, and hence the capital adequacy of the institution. The Committee believes that such disclosures have particular relevance under the Framework, where reliance on internal methodologies gives banks more discretion in assessing capital requirements. Think about it – a government guarantee, particularly one that guarantees wholesale funds as well, renders all this work pointless as there is no “market discipline” on any of the ADIs in Australia. They all have exactly the same risk on borrowed funds as any other as they are all government guaranteed. Sad really – all this for nothing. Easy win here for the CBA, with NAB a distant second. The ANZ is next, a little more distant, with Westpac easily tail-end charlie. As I said earlier, I hope the others look to the CBA in the next round. If they had added in the capital numbers at the tail of the qualitative disclosures I would have said they were best practice – but at least it gives them a little room for improvement.